Not to be confused with Neuroevolution. For a theory of evolution in nervous systems, see Neural Darwinism. The evolution of nervous systems dates back to the first development of nervous systems in animals (or metazoans). Neurons developed as specialized electrical signaling cells in multicellular animals, adapting the mechanism of action potentials present in motile single-celled and colonial eukaryotes. 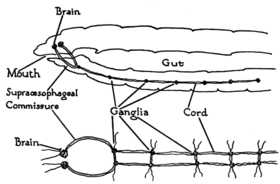 Simple nerve nets seen in animals like cnidaria evolved first, followed by nerve cords in bilateral animals – ventral nerve cords in invertebrates and dorsal nerve cords surrounded by a notochord in chordates. Bilateralization led to the evolution of brains, a process called cephalization. Action potentials, which are necessary for neural activity, evolved in single-celled eukaryotes. These use calcium rather than sodium action potentials, but the mechanism was probably adapted into neural electrical signaling in multicellular animals. In some colonial eukaryotes such as Obelia electrical signals do propagate not only through neural nets, but also through epithelial cells in the shared digestive system of the colony. Behaviors such as the "tail-flip" escape reaction in crustacea such as crayfish and lobsters are fixed action patterns that may have evolved from earlier ancestral patterns. There has been a gradual increase in brain volume as the ancestors of modern humans progressed along the human timeline of evolution (see Homininae), starting from about 600 cm3 in Homo habilis up to 1500 cm3 in Homo sapiens neanderthalensis. Thus, in general there is a correlation between brain volume and intelligence. However, modern Homo sapiens have a smaller brain volume (brain size 1250 cm3) than neanderthals; women have a brain volume slightly smaller than men, and the Flores hominids (Homo floresiensis), nicknamed "hobbits", had a cranial capacity of about 380 cm3, about a third of the Homo erectus average and considered small for a chimpanzee. It is proposed that they evolved from H. erectus as a case of insular dwarfism. In spite of their threefold smaller brain there is evidence that H. floresiensis used fire and made stone tools as sophisticated as those of their proposed ancestor, H. erectus. Iain Davidson summarizes the opposite evolutionary constraints on human brain size as "As large as you need and as small as you can". Brain evolution can be studied using endocasts, a branch of neurology and paleontology called paleoneurology. ↑ Matthews, Gary G. (2001). "Evolution of nervous systems". Neurobiology: molecules, cells, and systems. Wiley-Blackwell. p. 21. ISBN 0-632-04496-9. ↑ Sakarya O, Armstrong KA, Adamska M, et al. (2007). Vosshall L, ed. "A post-synaptic scaffold at the origin of the animal kingdom". PLoS ONE. 2 (6): e506. doi:10.1371/journal.pone.0000506. PMC 1876816 . PMID 17551586. ↑ Jacobs DK, Nakanishi N, Yuan D, et al. (2007). "Evolution of sensory structures in basal metazoa". Integr Comp Biol. 47 (5): 712–723. doi:10.1093/icb/icm094. PMID 21669752. ↑ Ruppert EE, Fox RS, Barnes RD (2004). Invertebrate Zoology (7th ed.). Brooks / Cole. pp. 111–124. ISBN 0-03-025982-7. ↑ Balavoine G (2003). "The segmented Urbilateria: A testable scenario". Int Comp Biology. 43 (1): 137–47. doi:10.1093/icb/43.1.137. ↑ Ghysen A (2003). "The origin and evolution of the nervous system". Int. J. Dev. Biol. 47 (7–8): 555–62. PMID 14756331. ↑ Erwin DH, Davidson EH (July 2002). "The last common bilaterian ancestor". Development. 129 (13): 3021–32. PMID 12070079. ↑ Bourlat SJ, Juliusdottir T, Lowe CJ, et al. (November 2006). "Deuterostome phylogeny reveals monophyletic chordates and the new phylum Xenoturbellida". Nature. 444 (7115): 85–8. doi:10.1038/nature05241. PMID 17051155. ↑ Lichtneckert R, Reichert H (May 2005). "Insights into the urbilaterian brain: conserved genetic patterning mechanisms in insect and vertebrate brain development". Heredity. 94 (5): 465–77. doi:10.1038/sj.hdy.6800664. PMID 15770230. ↑ ADEY WR (February 1951). "The nervous system of the earthworm Megascolex". J. Comp. Neurol. 94 (1): 57–103. doi:10.1002/cne.900940104. PMID 14814220. ↑ "Wormbook: Specification of the nervous system". ↑ Venturi, Sebastiano (2014). "Iodine, PUFAs and Iodolipids in Health and Disease: An Evolutionary Perspective". Human Evolution-. 29 (1-3): 185–205. ISSN 0393-9375. ↑ Ko, Kwang Hyun (2016). "Origins of human intelligence: The chain of tool-making and brain evolution" (PDF). Anthropological Notebooks. 22 (1): 5–22. ↑ Brown P, Sutikna T, Morwood MJ, et al. (2004). "A new small-bodied hominin from the Late Pleistocene of Flores, Indonesia". Nature. 431 (7012): 1055–61. doi:10.1038/nature02999. PMID 15514638. ↑ Davidson, Iain. "As large as you need and as small as you can'--implications of the brain size of Homo floresiensis, (Iain Davidson)". Une-au.academia.edu. Retrieved 2011-10-30.